Hal Holoun did not set out to be an artist but, when a teacher at Hastings College introduced him to the creative process, he pursued it with enthusiasm. Holoun earned a B.A. degree in art from Hastings College, Hastings, Nebraska, and an M.A. from the University of Wyoming, Laramie. Today, Holoun makes paintings that are influenced by the rich tradition of American landscape artists, the painterly innovations of 20th century abstractionists, and a deep understanding of the elemental forces of nature to which he was exposed as a child. In finding the balance among those influences, Holoun creates landscapes that reach beyond simple realism. Born and raised on a farm in Ord, Nebraska, Holoun lived and painted in Grand Island, Nebraska for many years. He now calls Bellevue, Nebraska his home. 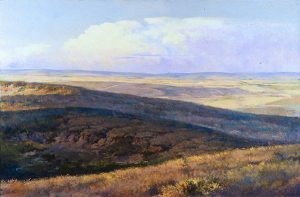 The Museum of Nebraska Art holds 5 works by Hal Holoun. ← George Hoffmeister, M. D.